Each pan is constructed by hand, starting with the bottom of a 55-gallon oil barrel. The bottom is hammered out into a concave shape, and the different notes are marked on the surface of this "bowl." (There is currently no standardized arrangement of the notes; each tuner has his own preferred setup for the different ranges of pans.) The edges of these areas are then "grooved" into the surface, by hammering grooves into the surface of the pan using a hammer and a nail punch (or chisel). This isolates the different areas of the surface, allowing for the creation of distinct pitches on the drums. Common practice calls for the larger (lower-pitched) notes to be situated near the edge of the barrel, with smaller (higher) pitches towards the center. The sides of the barrel are cut to a particular length (or left their full length, in the case of bass pans), depending on the range of the drum being constructed. Higher-ranged instruments will have a shorter "skirt" (the name for the sides of the instrument), and lower-ranged instruments will have longer "skirts." The space inside the instrument acts as a resonating chamber, helping to increase the volume of the instrument. Here is where the "magic" begins - although, the "magic" is nothing more than years of experience and skills developed by the individual tuner. By hammering each individual note, the metal is shaped and stretched, such that it produces not only the fundamental ("primary") pitch, but harmonics - harmonics which are also shaped and tuned by the instrument builder. Originally, these instruments were all tuned by ear, but modern-day tuners use strobe-tuners to finely hone their work. Once the tuning is completed, the drum is set over a fire, to re-temper the steel. After all of the hammering which has taken place, the metal is relatively malleable, and in that condition will not retain its tuning for long when played. The process of tempering makes the steel strong enough to withstand the rigors of performance. Instruments do need to be retuned from time to time, usually at least once a year, depending on how much the instrument is played. The final step is finishing off the instrument's surface, either by chroming or by painting, depending on the builder's preference. 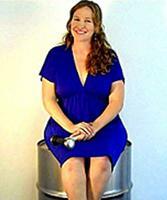 Emily Lemmerman, owner of Barracuda Steel Drums. Builder, tuner, performer and student of Ellie Manette. Emily tunes and blends all of Charlie's instruments. 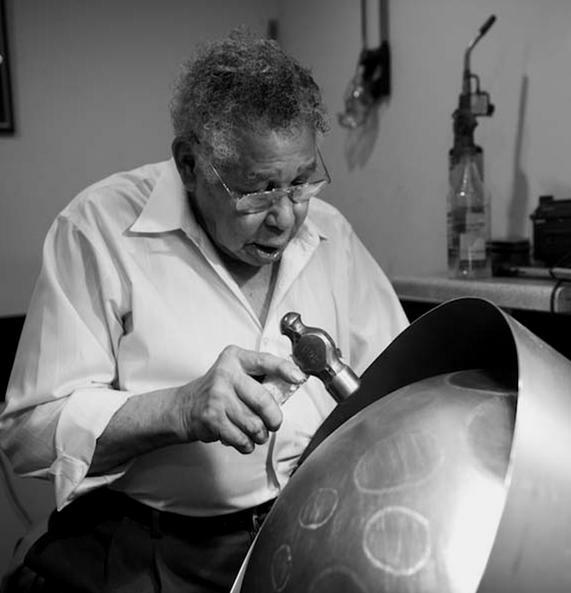 Ellie Manette, inventor of the modern Steel Pan instruments.